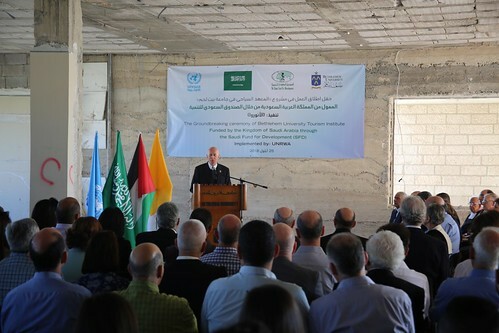 On Tuesday, 25 September 2018, Bethlehem University held a groundbreaking ceremony for the new “Bethlehem University Tourism Institute”, constructed on property purchased by the university in 2013. The ceremony was attended by Bethlehem University Vice Chancellor, Brother Peter Bray, Deputy Director of United Nations Relief and Works Agency in the Near East (UNRWA) Operations, Ms. Meg Audette, the Deputy Mayor of Bethlehem, Mr. Hanna Hanania, Deputy Minister of Tourism, Mr. Ali Abu Srour, and a number of notable community members, representing non-governmental organizations from the Bethlehem governorate, as well as faculty, staff and friends of Bethlehem University. The Master of the Ceremonies, Dr. Irene Hazou, Academic Vice President, welcomed the guests. Brother Peter welcomed the attendees in his address, and focused on the importance of the project and its expected contribution to the tourism sector in Palestine. “We have held so many meetings, agreed on all the brilliant ideas we wanted to implement, and all we needed was the funding. Luckily, we reached out to the Saudi Fund for Development (SFD) who generously agreed to fund this project,” he said. Deputy Minister of Tourism, Mr. Ali Abu Srour, said this project will add quality to the development of the hotel industry at this university. It will also add practical training for the students to obtain the necessary and sufficient period of training which will enable them to engage in the labor market quickly. Abu Srour added that this project will enable the university to be a leader in practical training alongside the academic sector of tourism in Palestine. In his speech, Deputy Mayor, Hanna Hanania, confirmed the municipality’s support to development projects in the area. “We, at Bethlehem Municipality, are one of the strongest supporters of such academic projects. We encourage all academic institutions that enhance the tourism sector in Bethlehem as it is the first tourist destination for the Christian world, which requires concerted efforts to promote the city and to prepare it to receive the pilgrims,” Hanania said. Dignitaries knocked the first wall in the building, symbolizing the start of the renovations. Father Ibrahim Faltas, advisor to the Custodian of the Holy Land and a member of the Board of Directors of the Bethlehem University Tourism Institute, blessed the site. He recalled the visit of Pope Paul VI to Palestine in 1964, which resulted in establishing Bethlehem University. In 2013, Bethlehem University acquired a new facility located in the heart of Bethlehem city within a seven minute walk from its current campus. The acquisition of the Mount David site of some 12,000m2 increases the land and facilities of Bethlehem University by about 30%, representing a generational opportunity to significantly alleviate existing space pressures and expand educational offerings. The 40 anniversary for Bethlehem University in 2013 was a milestone for revising and developing the study programs offered in the different university faculties, taking into consideration the current and the future needs of the Palestinian people. The university administration adopted a five year development plan for this purpose, in which expanding, developing and moving the Bethlehem University Tourism Institute, the smallest faculty of the university, to the new location in the center of Bethlehem city was a pillar. Through the generous funding of the SFD, this location will be renovated and made ready to receive the Institute of Tourism and Hotel Management, expanded to incorporate a vocational training track in parallel to new academic programs and a training hotel. Through this project the bar for the art of hospitality and tourism sector will be raised. The project is also expected to provide job opportunities for the institute graduates and for the tourism sector workers, which will have a positive impact on the unemployment rate in this important sector; all of this will be subsumed into a larger entity - the Bethlehem University Tourism Institute (BUTI).